When you first start memcached, the memory that you have configured is not automatically allocated. Instead, memcached only starts allocating and reserving physical memory once you start saving information into the cache. When you start to store data into the cache, memcached does not allocate the memory for the data on an item by item basis. Instead, a slab allocation is used to optimize memory usage and prevent memory fragmentation when information expires from the cache. With slab allocation, memory is reserved in blocks of 1MB. The slab is divided up into a number of blocks of equal size. When you try to store a value into the cache, memcached checks the size of the value that you are adding to the cache and determines which slab contains the right size allocation for the item. If a slab with the item size already exists, the item is written to the block within the slab. If the new item is bigger than the size of any existing blocks, then a new slab is created, divided up into blocks of a suitable size. If an existing slab with the right block size already exists, but there are no free blocks, a new slab is created. If you update an existing item with data that is larger than the existing block allocation for that key, then the key is re-allocated into a suitable slab. For example, the default size for the smallest block is 88 bytes (40 bytes of value, and the default 48 bytes for the key and flag data). If the size of the first item you store into the cache is less than 40 bytes, then a slab with a block size of 88 bytes is created and the value stored. If the size of the data that you intend to store is larger than this value, then the block size is increased by the chunk size factor until a block size large enough to hold the value is determined. The block size is always a function of the scale factor, rounded up to a block size which is exactly divisible into the chunk size. For a sample of the structure, see Figure 16.5, “Memory Allocation in memcached”. The result is that you have multiple pages allocated within the range of memory allocated to memcached. Each page is 1MB in size (by default), and is split into a different number of chunks, according to the chunk size required to store the key-value pairs. Each instance has multiple pages allocated, and a page is always created when a new item needs to be created requiring a chunk of a particular size. A slab may consist of multiple pages, and each page within a slab contains an equal number of chunks. 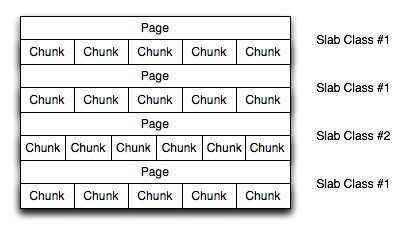 The chunk size of a new slab is determined by the base chunk size combined with the chunk size growth factor. For example, if the initial chunks are 104 bytes in size, and the default chunk size growth factor is used (1.25), then the next chunk size allocated would be the best power of 2 fit for 104*1.25, or 136 bytes. Allocating the pages in this way ensures that memory does not get fragmented. However, depending on the distribution of the objects that you store, it may lead to an inefficient distribution of the slabs and chunks if you have significantly different sized items. For example, having a relatively small number of items within each chunk size may waste a lot of memory with just few chunks in each allocated page. You can tune the growth factor to reduce this effect by using the -f command line option, which adapts the growth factor applied to make more effective use of the chunks and slabs allocated. For information on how to determine the current slab allocation statistics, see Section 16.2.4.2, “memcached Slabs Statistics”. If your operating system supports it, you can also start memcached with the -L command line option. This option preallocates all the memory during startup using large memory pages. This can improve performance by reducing the number of misses in the CPU memory cache.